While we were on our way to hit up Venice Garden after late night hockey, I noticed that there was a new Vietnamese joint on the corner of 2nd and Renfrew. It suddenly donned on me that I should give Steve (from the Chili Cookoff) a call to try the place out. Just like the time at Mr. Red, he is always game for new eats and in particular, the ethnic variety. Well, it was apparently meant to be as I received an email the day after suggesting that we meetup at Pho Ngon (which was the same place I had in mind!). Onto the food, as much as I make a big deal about the spring roll wrappers, I have begun to accept the use of wheat wrappers. Why? Well, they are much easier to deal with as they don't dry out like the rice wrappers. 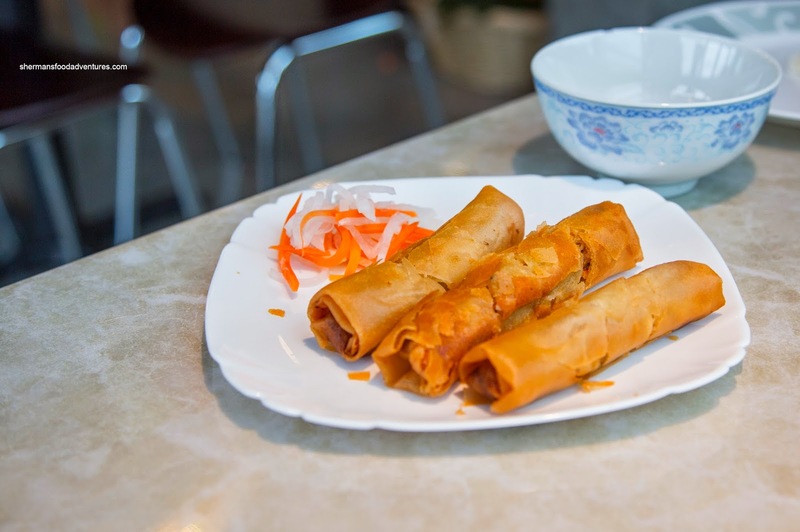 So with that in mind, the Spring Rolls here were decent with a crispy exterior that was easy on the grease and a filling that was filled with moist pork that was adequately seasoned. 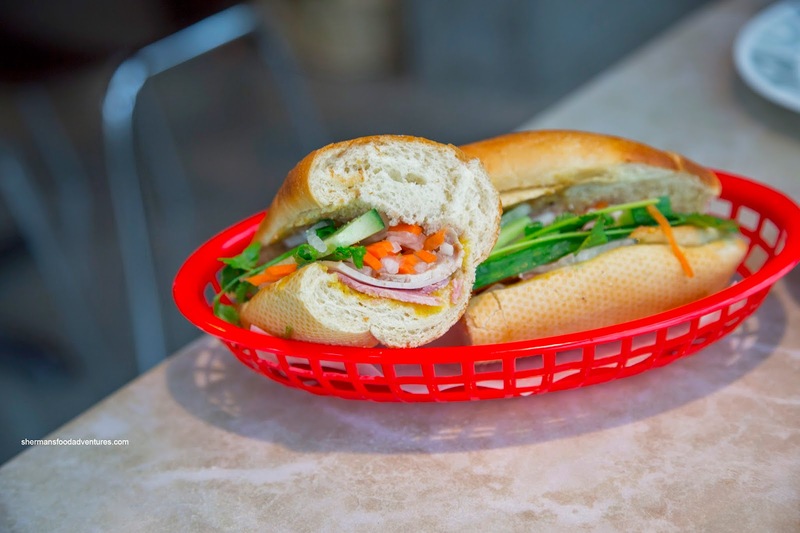 We also didn't mind the Banh Mi Dac Biet where the baguette was crusty and only a touch dense. There was enough meat to make an impact while the amount of pate could've been increased. Also, an extra splash of fish sauce or Maggi would've brought the flavours alive. 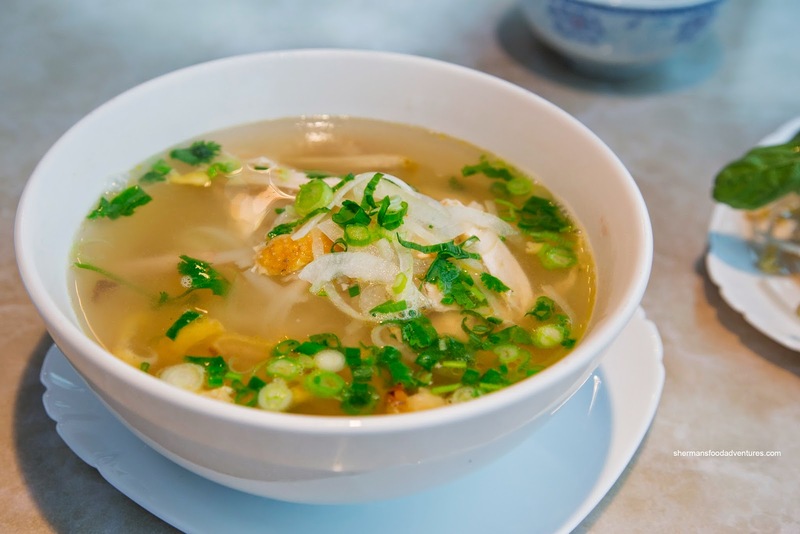 As for our mains, we tried the Pho Ga first. The broth was clean and light with only a minor saltiness. I didn't get a whole lot of chicken flavour but it wasn't bland either where there was a noticeable sweetness. The noodles were a touch soft, but not overly so. The modest amount of chicken meat was sufficiently moist with gelatin-like skin attached. We also had the Pho Tai Nam Bo Vien where the broth was a bit murky and did not have the cleanest of flavours. However, there was indeed flavour in the form of a light meatiness accented by sweetness. There was something missing as the broth didn't have a whole lot of impact. The noodles were slippery and a bit past al dente while the meats were sliced thin and tender. 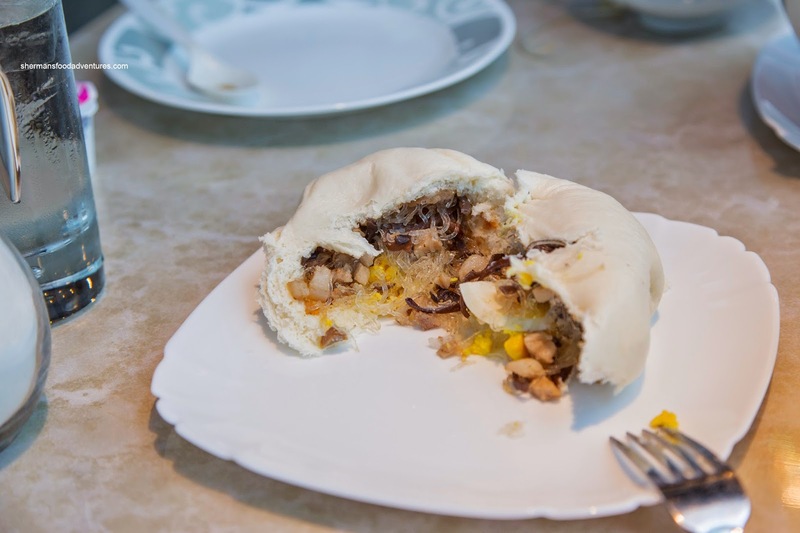 Lastly, we had the Banh Bao Dac Biet filled with wood ear mushrooms, vermicelli and egg. We found the bun itself to be a touch dense and not as fluffy as we would've liked. It was still okay though. The filling was quite nice and mildly seasoned. 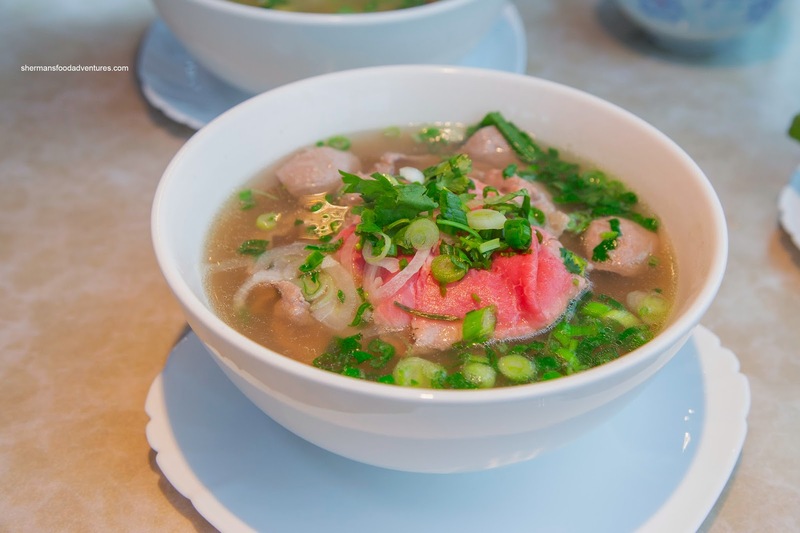 Overall, we found the food a bit lacking at Pho Ngon. Definitely serviceable, but considering the vast amount of other Vietnamese restaurants, it doesn't do enough to stand out. I've been back there a couple of times since, and thought I might add that the restaurant itself is fairly clean and comfortable, however, with all the glass and concrete surfaces, the ambient noise in the room can get quite loud if they get a full house. 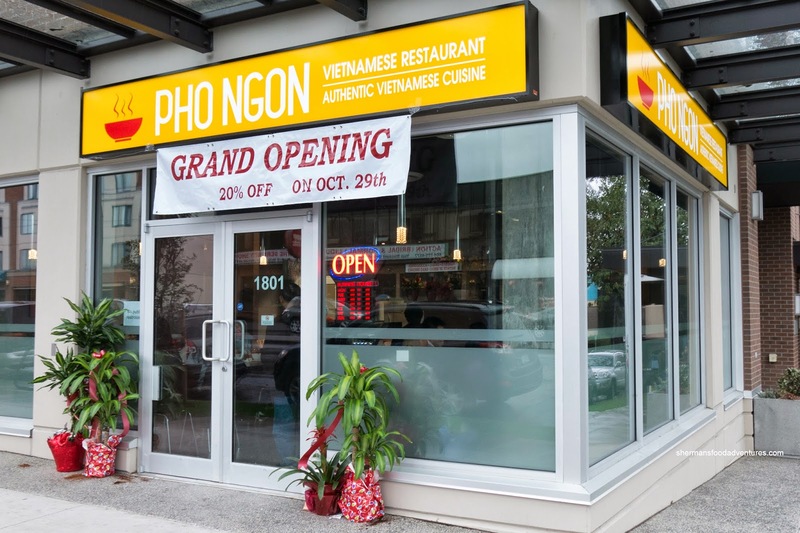 With so many other good Vietnamese restaurants around, I agree that they are going to have to step up their game a bit if they want to succeed. Update, April 2017: Pho Ngon has gone out of business. A new restaurant has opened up in this location - Jiro Sushi & Ramen.